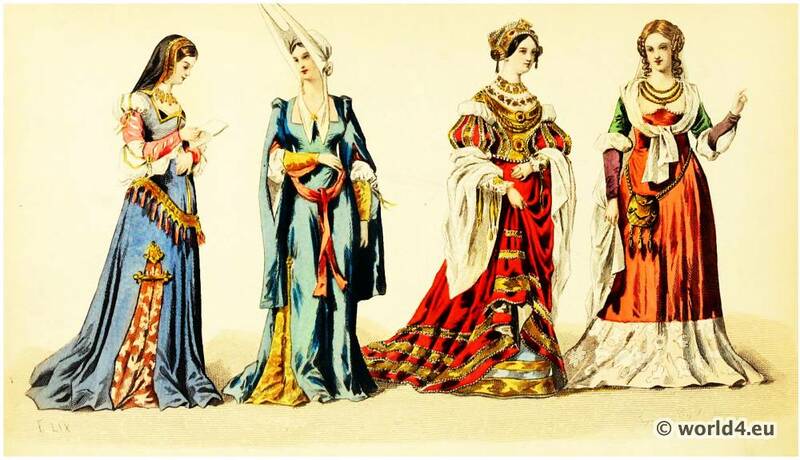 Home » Fashion under the Reigns of Louis XI., 1461 to 1515. Sudden change in the whole character of costume. Duchesses and bourgeoises under Louis XI. Duchesses and bourgeoises under Louis XI. 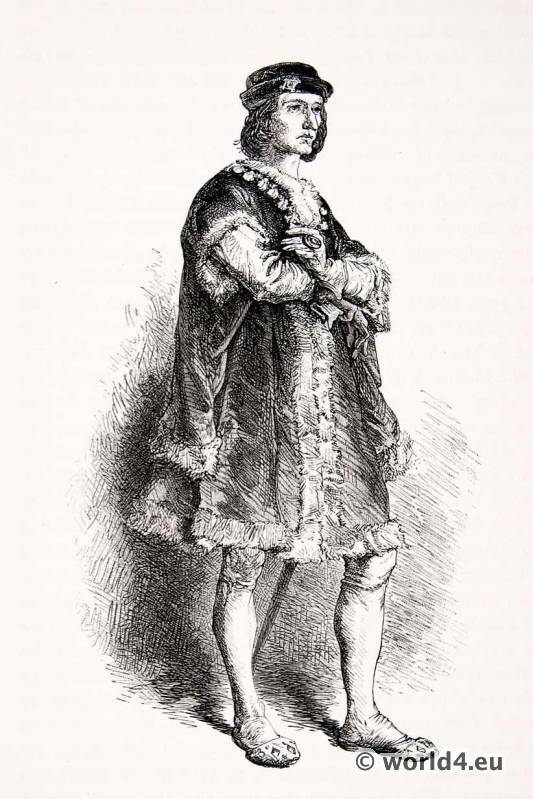 – “La grand gorre,“ or sumptuosity – The “troussoire” – Allegorical and moral costumes – Trains – Head-dresses —”Collets rebrassés ” – Wigs and false hair — Some results of the war in Italy – Italian fashions — “Sollerets” and slippers – Gorgets – Garters – Jean Marot writes against novelties – Anne of Brittany – Pins – Menot “the golden-tongued” – A Parisian in the time of Louis XII. – Coat à I’ltalienne – Manufacture of stuffs. 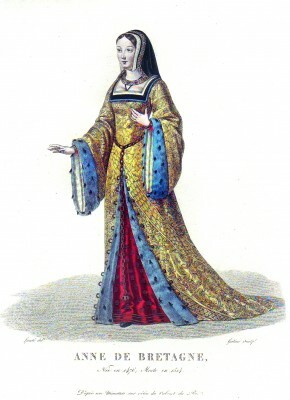 Dame de la cour de Louis XI. 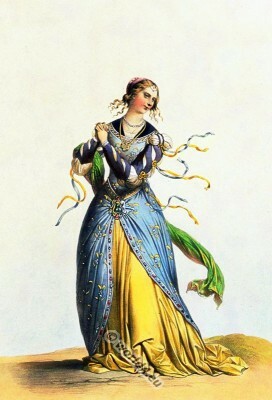 XIVe siècle. 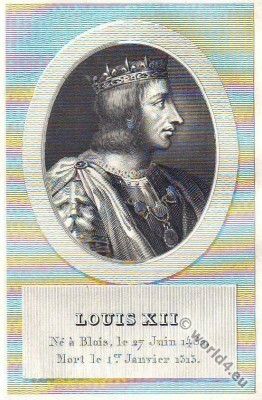 Louis XI. 1423-1483, called le prudent, le ruse or l’araignée was from 1461 to 1483 King of France. 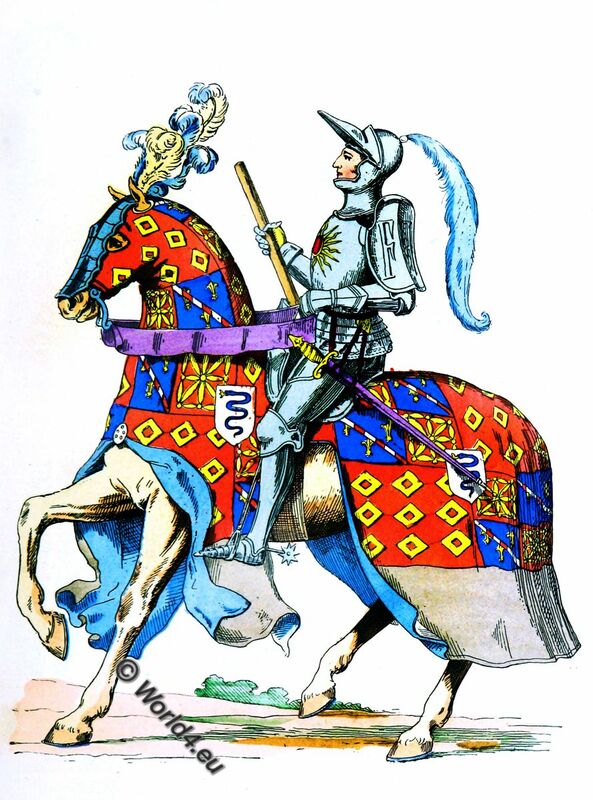 Charles VIII, 1470-1498, called l’Affable or le Courtois; was from 1483 to 1498 King of France. 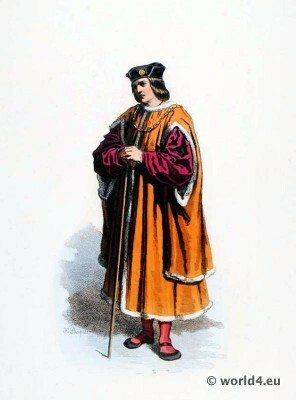 He was the third and only surviving son of Louis XI. of France and his wife Charlotte of Savoy. He was the seventh king of the House of Valois and with his death ended the Valois Main Line. Louis XII. 1462-1515 was from 1498 to 1515 King of France. 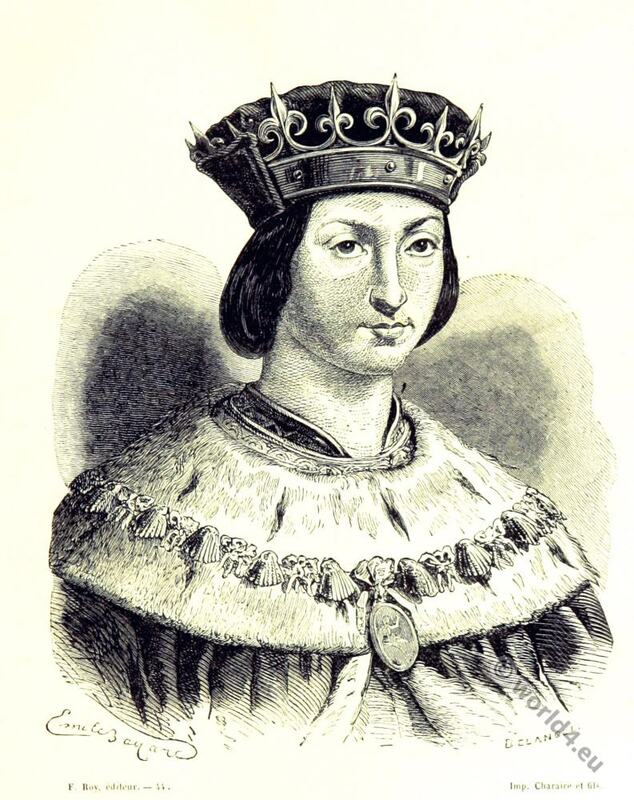 The continued epithet of Louis XII was and is “père du peuple”, “father of the people”. This goes back to a meeting of deputies of the cities of Tours in 1506, as the honorific name was given to him by the spontaneous exclamation of a citizen. The Empire of Fashion was scarcely founded, ere it began to promulgate those despotic laws which have never been relaxed to the present day. The spread of luxury, art, and comfort, which became manifest at the dawn of the Renaissance, led to a sudden change in the whole character of costume. This fact has been commented on by all historians ; and can be verified and explained by the archives of the period. 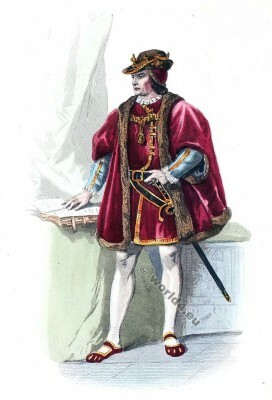 Although for the most part Louis XI. affected a great simplicity in his dress, and was fond of playing the “bourgeois,” yet at times he desired to see his palace filled with nobles richly attired, and wearing magnificent stuffs, even of foreign manufacture. 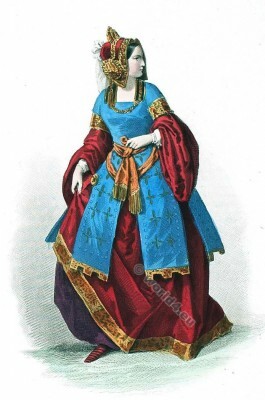 Anne of France (Anne de Beaujeu 1461 – 1522) “Madame la Grande”. 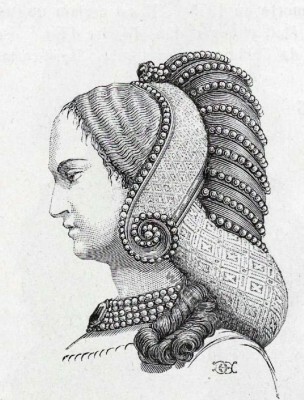 Daughter of Louis XI. 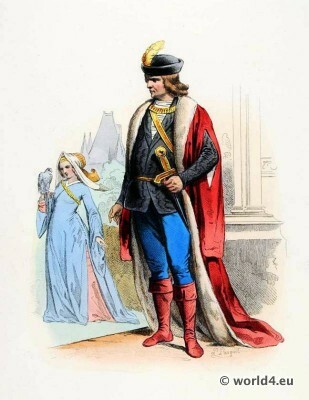 The astute sovereign appreciated the influence of fashion on commercial prosperity. Heureux est qui en finira! 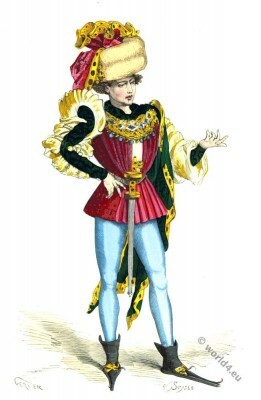 Bourgeois in the Reign of Louis XII., 1510. 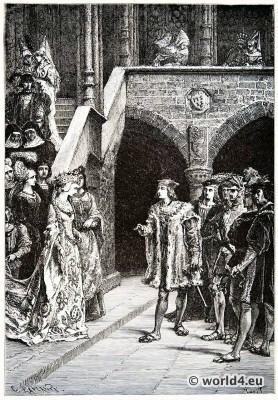 Baron and Baroness in the reign of Charles VIII., 1498. So long as the bourgeoises dressed above their station, it was naturally next to impossible that the female aristocracy should not endeavour to eclipse their humbler rivals. “The married ladies, and the young ladies at the court of Louis XI., no longer wore trains to their gowns, but they wore borderings of fur and of velvet, and of other materials the same width as velvet; on their heads they wore round padded caps, with peaks half a yard in height— some more, some less— and fastened above these were long veils reaching to the ground behind, with silken girdles four or five inches wide, with both the metal work and the tissue wide and gilt, and weighing six or seven silvern ounces; and on their necks broad collars of gold of diverse workmanship.” One side of their long skirts was held up by a “troussoire” or clasp. The troussoire consisted of a chain, of more or less value, which was attached to the girdle and to which a small scentbox, some keys, and a strong clasp for holding up the gown, besides other little articles, were suspended. 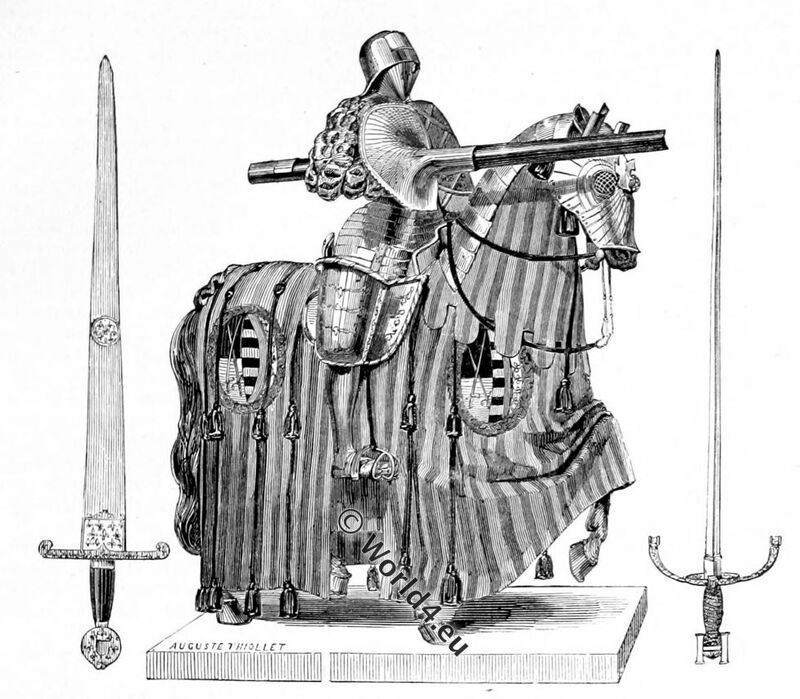 Tournament armor in the 15th century. Dresses were now profusely trimmed with ribbons and cords; and the mode of the silk corset separate from the skirt was adopted; the gown was of Florence satin, open up the front, and in winter lined with badger’s fur. Courtisane in the Reign of Charles VIII., 1491. 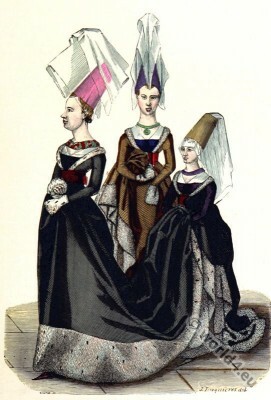 Working women going into the towns to sell their merchandise or their work, wore a white apron and a gown of cloth, serge, or woollen; they were bareheaded, the hair being confined by a band on the forehead and hanging loosely behind. They imitated the bourgeoises in the make of their dresses, but refrained from trains. The fashion of hanging sleeves was succeeded by that of tight, close-fitting ones. 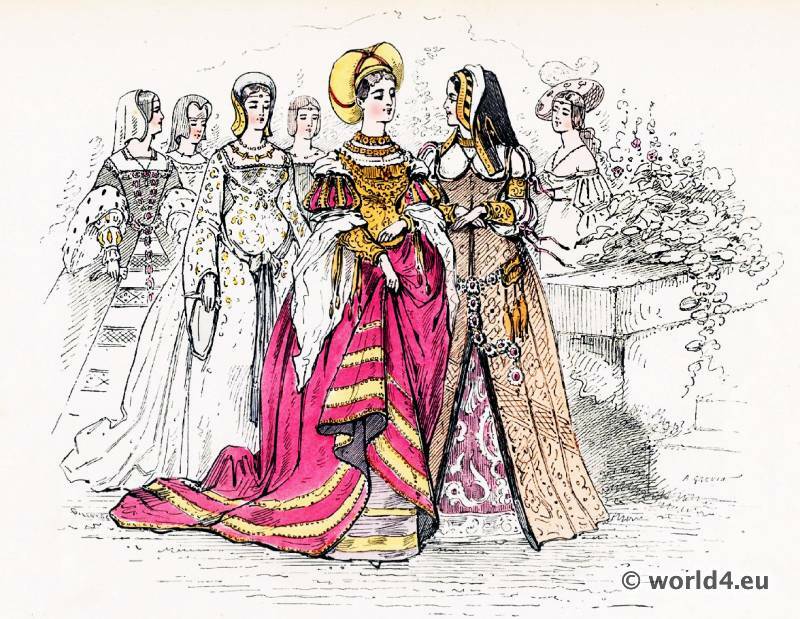 Gowns were made with bodices laced up in front like the Swiss costume; and the collars, sleeves, and edge of the skirt were bordered with a wide band of velvet; the sleeves hung down to the ground. A girdle of velvet covered with goldwork fitted tightly to the waist. Another girdle called a “surceinte” embroidered with mottoes, initials, and even with heraldic arms, confined the outer garment. There were three kinds of head-gear, the pyramid, the truncated, terminated by a button, and the small “barillet,” which was like a little barrel. Hats were more general under Charles VI. and Charles VII., and were worn at all times. 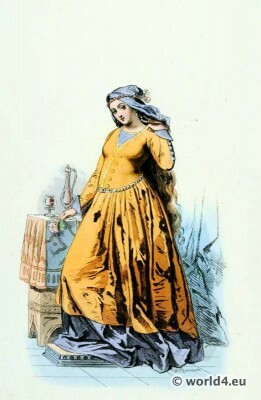 Long hair, whether natural or false, was called a wig. Poets raised their voices against the false hair, which was worn over the forehead till it touched the eyes; the ears were hidden by it, and the ends, reaching to the shoulders, were curled. The hair was either white, or of the bright yellow colour fashionable at the present day. An infusion of onion-skin was sometimes used as a dye. 1490. 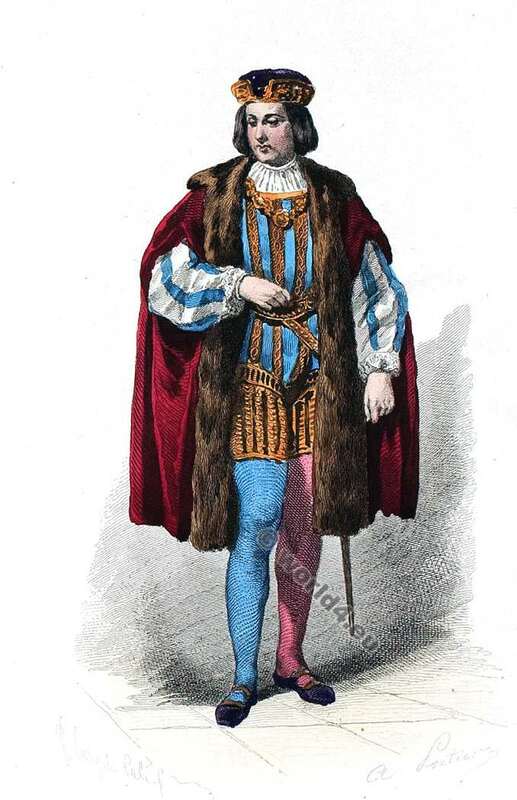 Charles II d’Amboise (1472 – 1511) was military governor of Paris and Marshal of France as well as admiral of France. 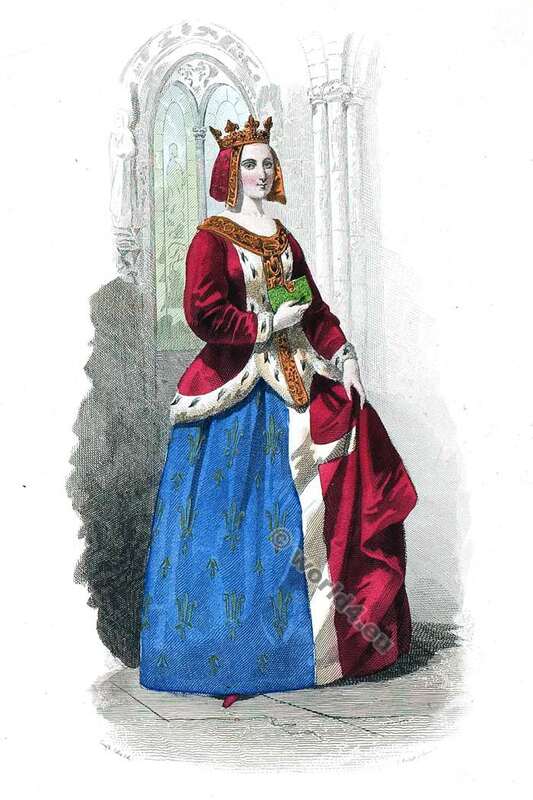 Lady of the manor in the reign of Charles VIII. 1498. 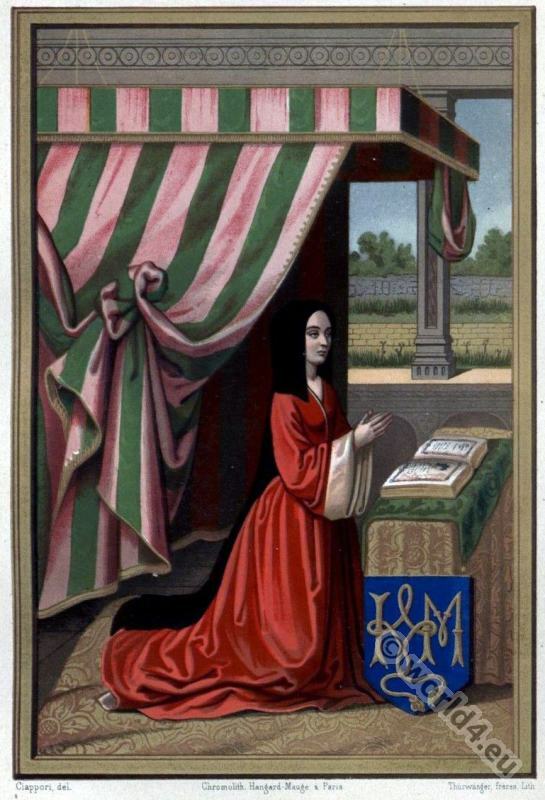 Dame nobles de 1495 à 1500. Hair Fashion from 1495 to 1500. Hennin. 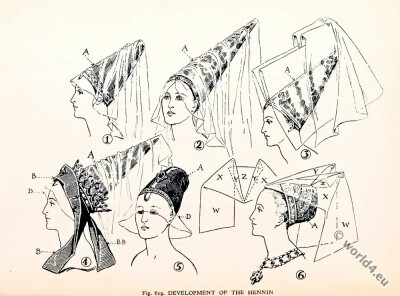 Headdresses of the 15th century. 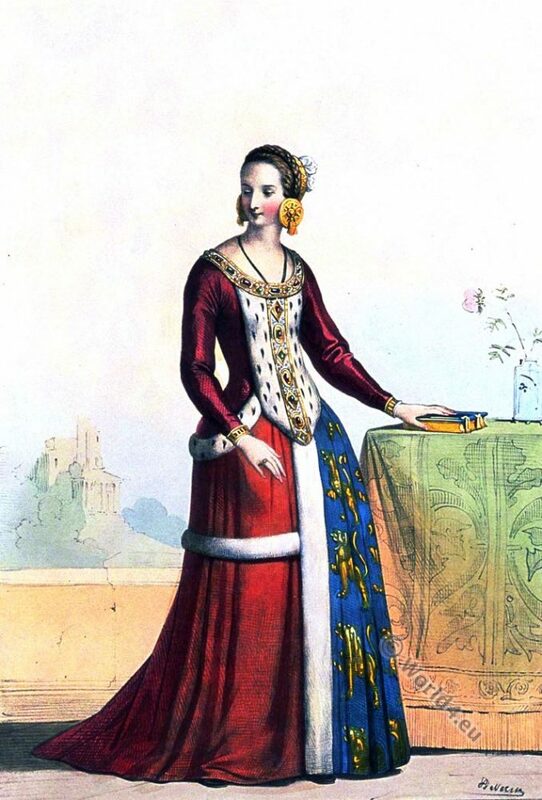 The fashion of long hair and also of false hair lasted until the close of the reign of Louis XII. 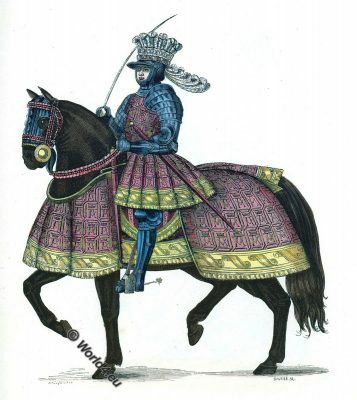 The admirable miniatures on the manuscripts of the fifteenth century certainly point to an improvement in head-dressing, as well as in attire generally. 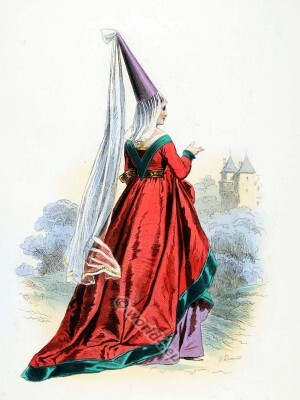 We learn from them that the sugarloaf head-dress was in fashion during the whole of that century. 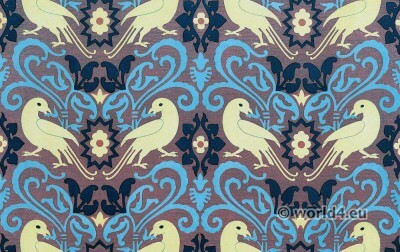 It was ordinarily bordered in front with gold embroidery on black velvet. That portion of the dress which covered the chest was of black velvet, embroidered in the upper part, and of gold tissue as far as the waist. The outer dress was of blue velvet, embroidered in gold, and lined and bordered with crimson velvet. The edge of the sleeves was of the same. The veil was white and transparent, the belt green, and sparkling with gold ornaments. That part of the under-dress which was visible below was violet; the shoes were black. Fifteenth century costumes. Princess with her ladies 1470. After the book of Tournament of King René (René of Anjou 1409 –1480, le Bon Roi René). Charles VIII l’Affable or le Courtois 1470 – 1498. The companions of Charles VIII. were not less astounded than were those of Christopher Columbus.” The Italians, on the other hand, greatly admired the agreeable manners of the French. As Charles VIII. made his progress through their country, they assumed the French mode of dress, and sent for all manner of finery from France. Victors and vanquished made mutual exchange of manufactured productions. The French, who still wore the striking costumes of the days of chivalry, excited eager curiosity wheresoever they went, and the greater the contrast between their garments and those of the Italians, the more did the latter delight in wearing the French fashions. They willingly exchanged their Genoese trinkets and jewels against the products of the Arras looms, if only from mere love of novelty. When the King of France had once more crossed the Alps and returned to his capital, the French ladies in their turn experienced the fascination that the soldiers of Charles VIII. had succumbed to in Italy. Their “heads were” likewise “turned,” and their enthusiasm naturally had its effect on the fashions of the day. 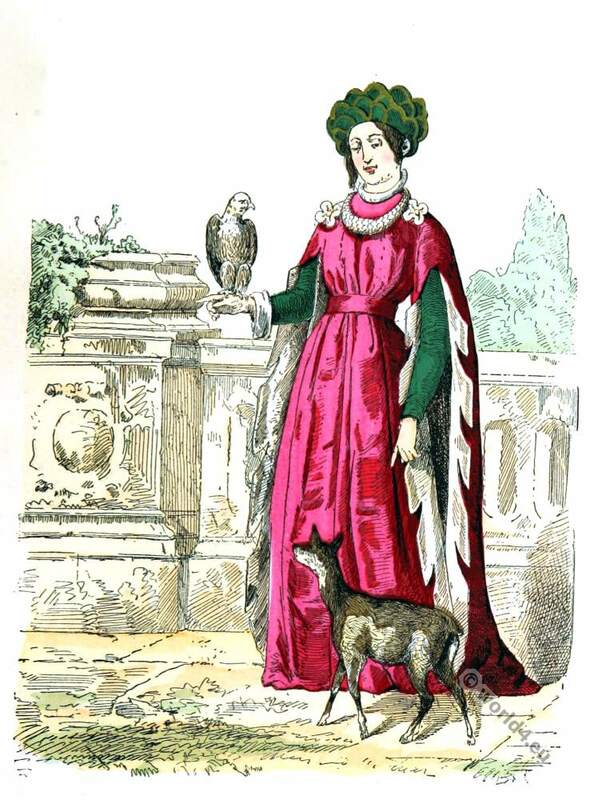 Our fair countrywomen laid aside the sombre garments of the time of Louis XL, and began to wear the brightest colours, as well as several materials of Milanese or Venetian manufacture. 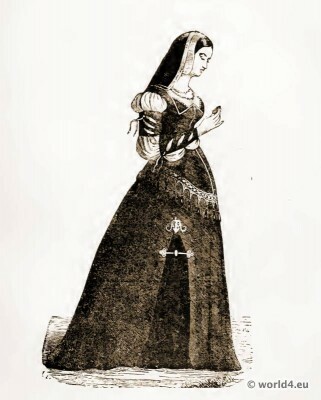 Many Italian fashions were added to our national costume viz., tight fitting bodices, highly ornamented; very wide sleeves; white gowns trimmed with many coloured fringes; and black veils. The ladies would no longer wear the hennin, which had been so fashionable in the reign of Charles VI., and declared it was horrible. 1475. 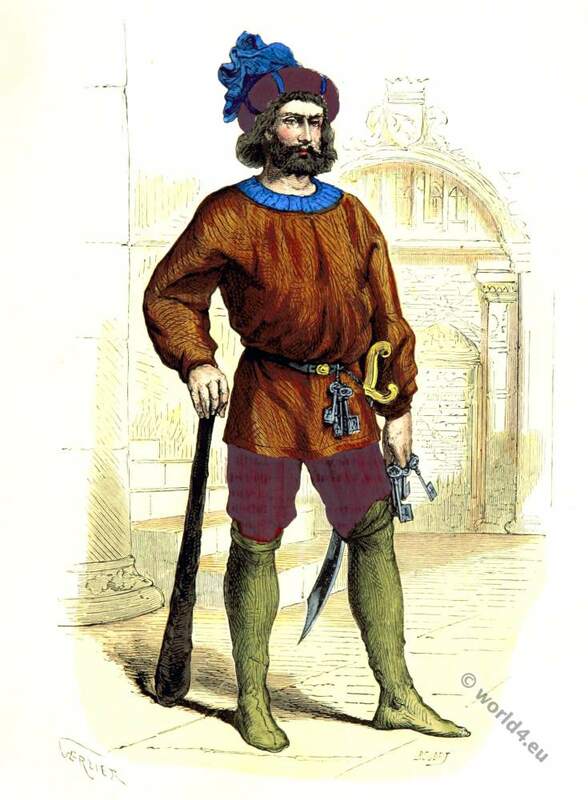 Pierre I. de Rohan, named Maréchal de Gié (1451 presumably in the Mortier-Crolles castle in Saint-Quentin-les-Anges, died on 22 April 1513 in Le Verger castle in Seiches-sur-le-Loir) was Seigneur de Gyé and Ham, Comte de Marle, Marshal of France, diplomat and adviser to the kings of Louis XI, Charles VIII and Louis XII. With him the rise of the house Rohan begins one of the first families of France. Hose, or stockings, were composed of several pieces of stuff sewed together. Chemises of woollen stuff were in general use. 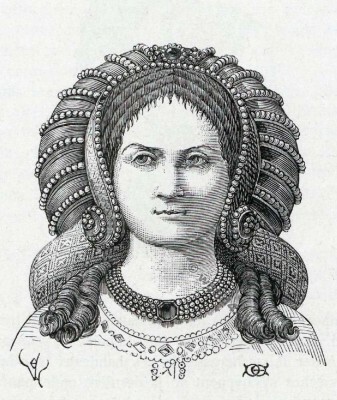 The “gorgerette” or gorget, a linen collar, either plain or plaited, reached as high up as the collar-bones, and was worn over the “piece” or “plastron” of stuff that was laced across the chest. The “demi-ceint” was a small silken scarf, wound about the waist and fastened in front by a rosette. 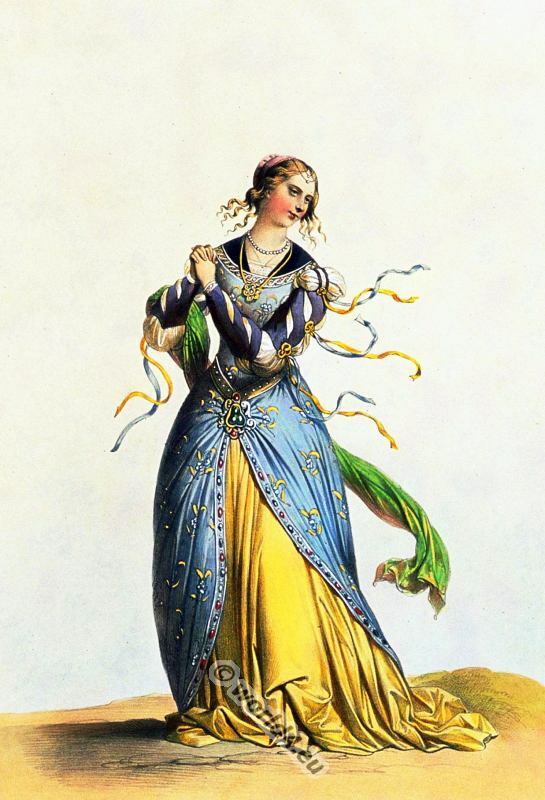 The “ceinture” was a wide ribbon, worn flat over the hips and ending in an angle on the skirt, where it formed a rosette with two floating ends. Among the accessories of dress were garters, either fastened by a buckle or simply tied. These were ornamented, in the fifteenth century, with mottoes or initials. Women also made use of pincushions, of purses in the shape of bags, of knives, of “rings” — meaning probably necklaces, and of paternosters or rosaries of gold, pearls, or other valuable materials. These were fastened to the knot of the girdle, and hung down in front of the gown. Louis XII (1462 – 1515) „père du peuple“ from the House of Valois-Orléans. We have already mentioned these rosaries. In the reign of Louis XII., the successor of Charles VIII., the dress of women was but slightly changed. 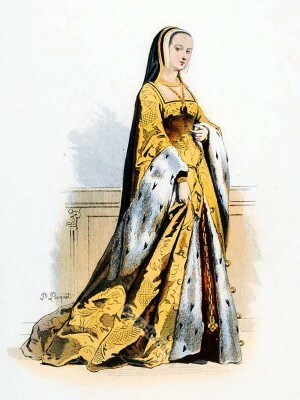 The upper gowns were made shorter, reaching only to the knees, and resembled a wide cloak or cape, cut low on the bosom. One great novelty was the shape of the sleeves, which in the upper gown remained wide and flowing, but those belonging to the under bodice consisted of several separate pieces fastened together by ribbons. 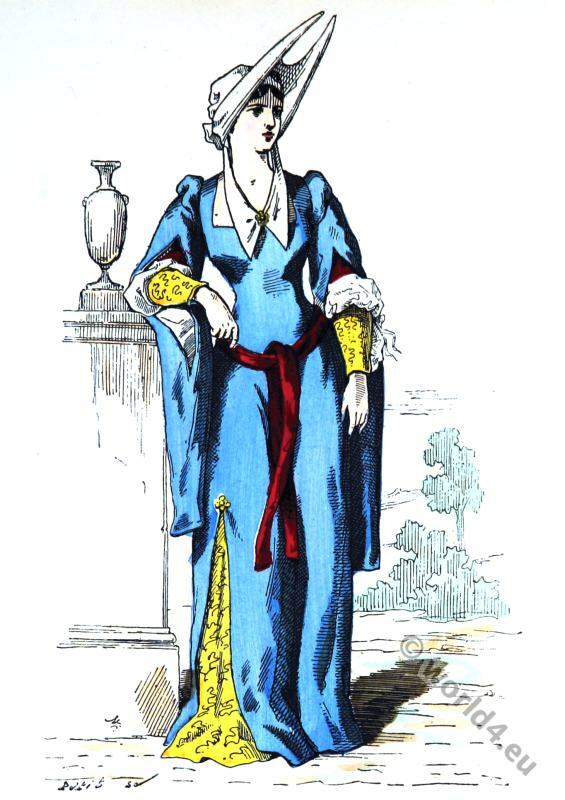 We can picture to ourselves the elegant appearance of a sky-blue bodice, of a dark blue cloth gown, and of green sleeves in superfine cloth. Meeting between King Charles VIII and Anne of Brittany by Alphonse de Neuville. Anne of Brittany (1477 – 1524) in 1500. 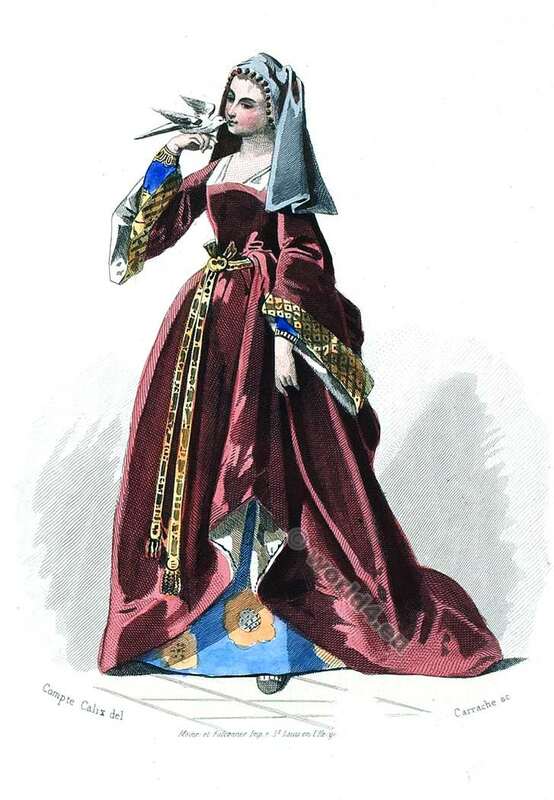 A considerable number of wealthy ladies began to frequent the court, attracted thither by the fascinating manners of Anne of Brittany, ” the good queen,” whose whims became a law, according to which all Frenchwomen regulated their dress, whatever might be their position in the social scale. It is worthy of remark that, at the close of the Middle Ages and during the first years of the Renaissance, brides wore red or scarlet on their wedding-day. Anne of Brittany was celebrated for the beauty of her leg and foot, and liked to wear her skirts short. Most women followed her example in that respect. For a long time past ladies had made use of pins, gilt pins even; they now began to outstrip the bounds of moderation in their use. “Oh, ladies!” exclaimed Michel Menot, the Franciscan monk, surnamed the Golden Tongue, “Oh, ladies! who are so dainty, who so often miss hearing the Word of God, though you have only to step across the gutter to enter the church, I am certain it would take less time to clean out a stable for forty-four horses than to wait until all your pins are fastened in their places. 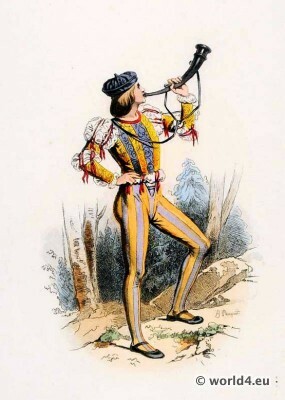 … When you are at your toilet you are like a cobbler, whose business is to ‘ stop up,’ and to ‘ rub,’ and to ‘ put to rights,’ and who needs a thousand different articles for bits and patches.” He added: “A shoemaker’s wife wears a tunic like a duchess.” Vainly did the preacher thunder against pins. Fashion could not be in the wrong. Presumptuous were they who attacked her, for her partisans increased with the number of her opponents. We must now point out a change in the mode of wearing mourning. The former queens of France had worn white for mourning. Young stylish fashion in 1480. 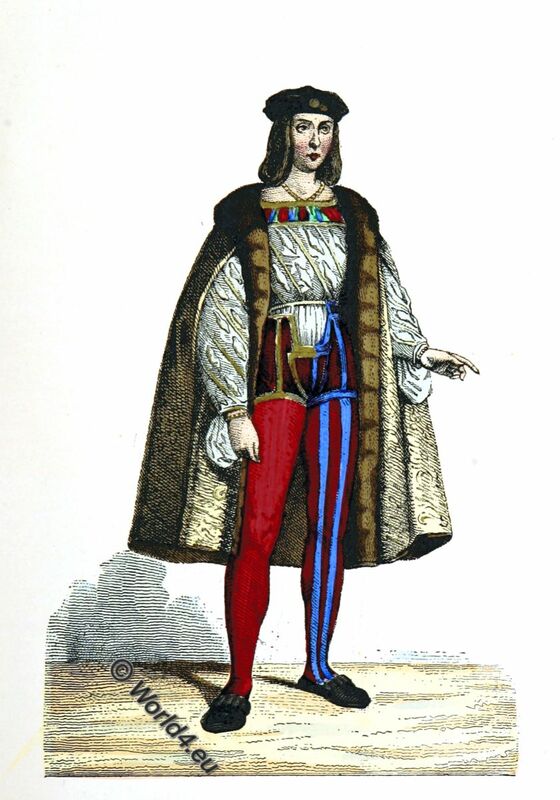 Costumes under Charles VIII., Louis XII., and François I. 1515 to 1547. 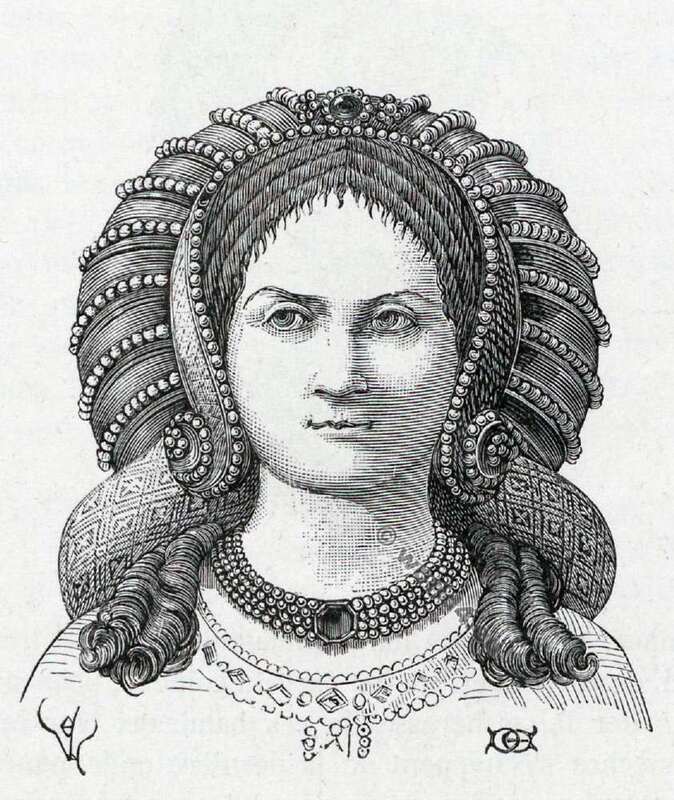 Sometimes, as we see by a manuscript in the National Library, French ladies would dress after the Italian fashion, that is, with a greater quantity of jewels, and without head-gear; their hair being curled at the side, and plaits wound round the head. Although extravagance in dress had not yet reached the point which it afterwards attained under the chivalrous Francis I., yet it began to be universally displayed in both masculine and feminine attire. At the privileged fairs, quantities of materials of more or less value were offered for sale. 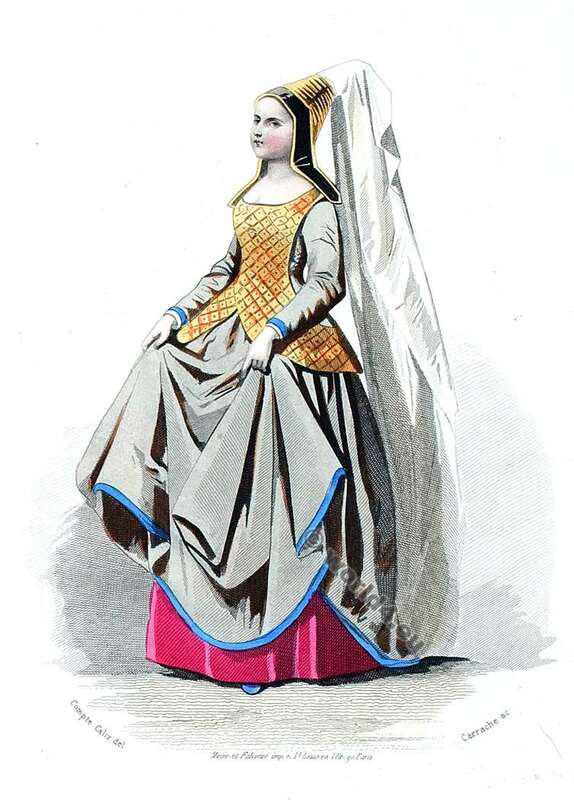 Bourges was so famous for its cloth, that wealthy purchasers frequently stipulated that their coats should be made in “fine Bourges cloth.” Foreign manufactures of gold, silver, and silk entered France by way of Susa, when coming from Italy; Spanish goods were sent by way of Narbonne and Bayonne, whence they were forwarded direct to Lyons, where they were unpacked and sold. The Paris ell was longer by one half than that of Flanders, Holland, England, and other countries. Ordinary wool for women’s garments was sufficiently plentiful in France. 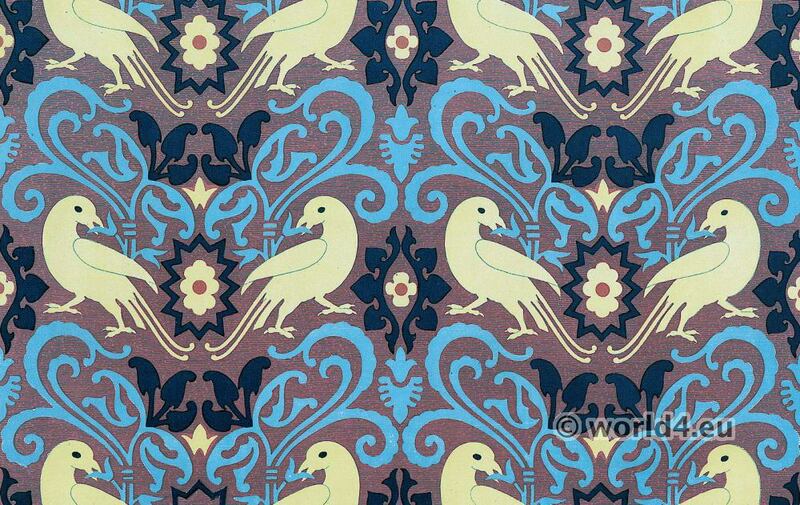 The finer cloths were generally manufactured from English and Spanish wools. Lower Brittany and Picardy supplied, it is true, a somewhat finer quality, which was used in the manufacture of certain cloths, and in particular for one called camelot. Linen-cloth was produced in considerable quantities, but was inferior in quality to the Dutch linen, which was much esteemed, and formed an important item in the trousseaux of young girls. 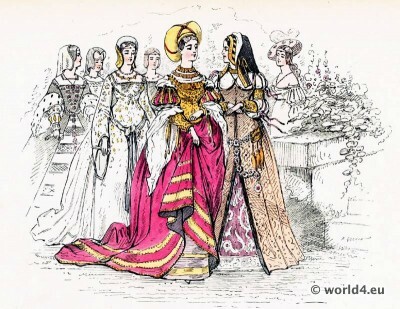 This entry was posted in 15th Century, 16th Century, Burgundian dress, France, French fashion history, Middle Ages, Renaissance and tagged Augustin Challamel, Burgundian fashion period, Gothic costumes, Hennin, Medieval costume on 6/16/14 by world4.